The evidence and symptoms of gingivitis, periodontitis and periodontal disease are typically diagnosed by Dr. Bakhtyari, Dr. Prokopets, or one of our hygienists during your regular dental exams at Premier Dental Care. A check for periodontal disease should always be an important part of your regular dental visits, as advanced periodontal disease can lead to separation of the gums from the teeth, followed by the loosening and potential loss of teeth. 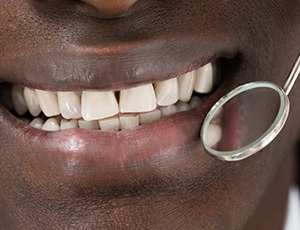 At Premier Dental Care, we utilize a periodontal probe to gently measure the depth of the pockets or gaps around and between each tooth and the surrounding gums. The periodontal probe is a small dental instrument that causes no discomfort to the patient. The depth of these spaces are important to the diagnosis of periodontal disease because as the disease progresses, the pockets become deeper and filled with toxins that attack the teeth, bone structures, and surrounding tissue.